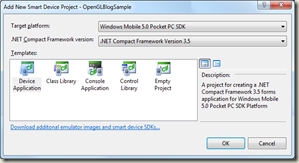 In my previous post on Getting Started with OpenGL on Windows Mobile I talked about taking the existing OpenGL ES wrapper by Koushik Dutta and extending it to make it easier to work with. In this, and subsequent posts, I’ll show you how you can take this wrapper and start building out an application. 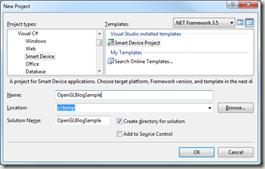 To get started create a new Smart Device project in Visual Studio 2008. 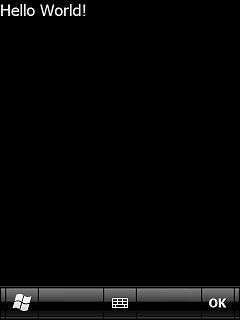 Note that I’ve created this against the Windows Mobile 5 SDK – if you can find a legacy device still running WM5 which supports OpenGL then this application will still run. I only bother building against the later SDKs if I particularly need one of the few features that were added since WM5. 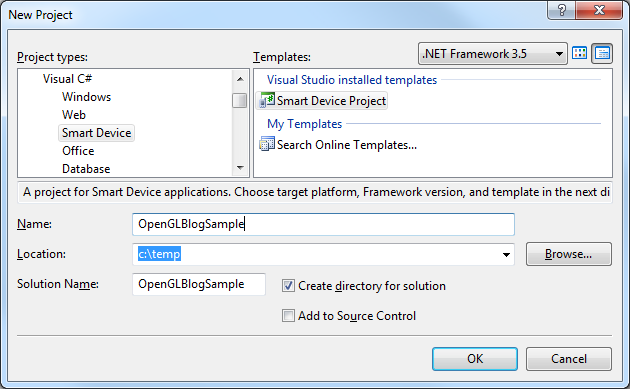 Next, copy the two OpenGL projects from the this link into your solution folder and add them to your solution within Visual Studio. 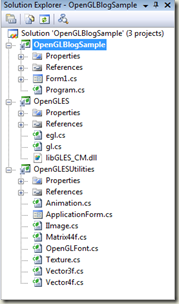 Also, go ahead and add a project reference from your application to both OpenGL projects. You won’t be needing the designer support for your form but you do need some of the initialization values set in the Form1.designer.cs file. It’s up to you whether you move the InitializeComponent method from your Form1.designer.cs file into your Form1.cs, and then delete Form1.designer.cs, or just leave the designer.cs file there and ignore it. 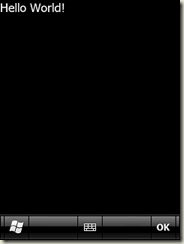 Not the worlds greatest demo, but surprisingly simple for an OpenGL application. 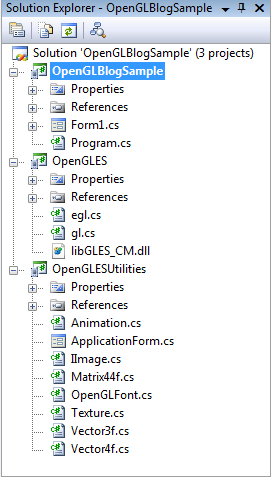 In the next post we’ll start to investigate what you can really do with OpenGL that you can’t do easily with traditional Windows Forms application. 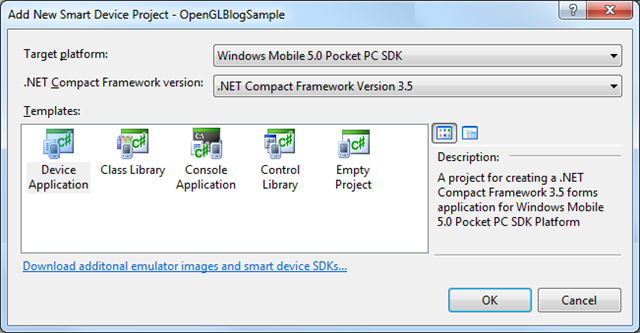 Unfortunately my attention has shifted to Windows Phone 7 so I doubt that I'll do many more posts on OpenGL. If there is something specific that you're interested in, please feel free to contact me and I can see what I can do. This is my subject field for my next coming session project and I don’t familiar how I can say my thanks for much kind of help oneself you did for building up my project incredibley. My name is ketty and I am trying to exploring on concerning matter for a effective documentation and obtained your internet site on top page of google .You have a nice and soft user interface along with good stuffs on your website .I too manage a personal web site and at present you are in my beloved site listing . thanks for the super service.have a beautiful day. I have been exploring for a little for any high quality articles or blog posts on this sort of house . Exploring in Yahoo I ultimately stumbled upon this web site. Studying this info So i am happy to show that I've an incredibly just right uncanny feeling I discovered exactly what I needed. I most indisputably will make sure to don¡¦t overlook this web site and provides it a glance a continuing. Even you will find several running for years, when you begin your barefoot managing training the very first thing you should know is that you will have to cut way back on your typical routine, and commence as though you were only getting started going.